Article sur le Disney Parks Blog : Authentically Disney and Distinctly Chinese : Shanghai Disney Resort Blends Magic of Disney with Spirit of China. Le reportage de la NHK est vraiment très sympathique ! Merci pour le partage ;-). 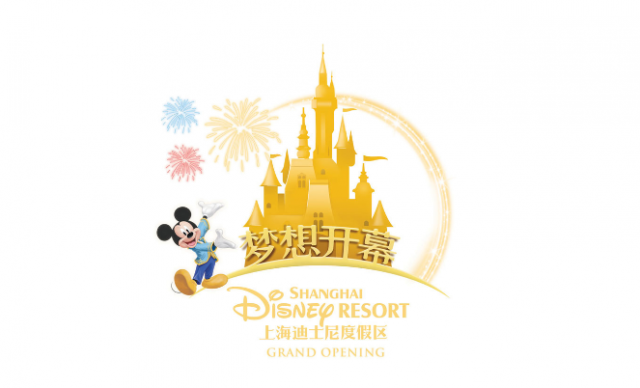 Shanghai Disney Resort will host a multi-day grand opening celebration June 14-16, with local and international media plus special guests in attendance for the historic occasion. The festivities will include the global premiere of the first-ever Mandarin production of the Broadway hit, Disney’s THE LION KING. Invited guests will also enjoy the beauty of Wishing Star Park, tour Shanghai Disneyland Hotel and Toy Story Hotel, and experience the attractions and entertainment of Shanghai Disneyland. Throughout the grand opening celebration, some areas of the resort may not be available to the public. Disneytown, the shopping, dining and entertainment district, is planned to be closed on June 14 as part of the event. Also, public transportation to and from the resort will have varying operating hours June 14-16. Access and operating hours are subject to change, so please check before making plans to visit Shanghai Disney Resort during that time. Tune in to the Shanghai Disney Resort Grand Opening Celebration on Dragon TV, June 15 at 7:30 p.m. CST. Take a very special look at Shanghai Disneyland in this two-hour extravaganza featuring special appearances by Honorary Ambassadors Sun Li, Lang Lang and Yao Ming. Watch the Enchanted Storybook Castle comes to life in the grand finale with an authentically Disney and distinctly Chinese blend of dynamic movements, pageantry, performances and, of course, fireworks. For more coverage of the grand opening celebration, follow Shanghai Disney Resort on Weibo (http://weibo.com/SHdisneyresort) and WeChat (search WeChat ID: ShanghaiDisneyResort). 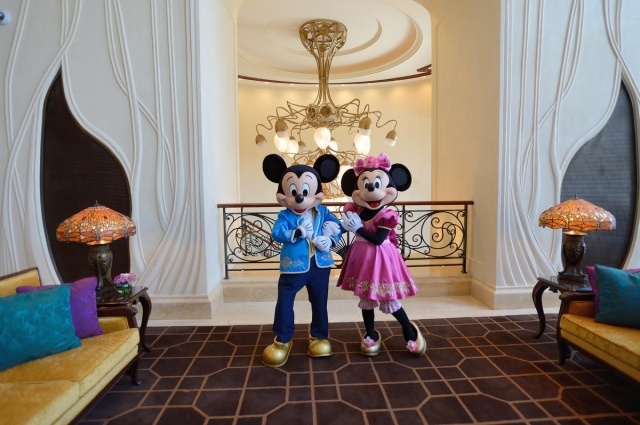 Shanghai Disney Resort will welcome its first official guests from 12:00-10:00 p.m. on June 16. Guests interested in visiting the resort’s theme park, Shanghai Disneyland, on June 16 must have a ticket before coming, as tickets for this date will not be sold on site that day. Tickets are still available for other dates throughout the summer and can be purchased at www.shanghaidisneyresort.com or through official travel partners. Shanghai Disney Resort - 12 juin 2016. AFTER a trial run which was completed yesterday, Pudong police are asking visitors to take the Metro to Shanghai Disneyland, which officially opens on June 16. Police are advising visitors to take Metro Line 11 to Shanghai Disneyland Station. The resort is only 5 minutes walk from the station. Those taking taxis will have to get off at the west public transport hub and walk 10 minutes to the resort. Private vehicles will have to parked 15 minutes away from the site. According to the statistics from the trial run, 55 percent of the visitors took Metro to the resort, 40 percent drove, and 5 percent took other means of transport, officer Wu Qiuping said. Where are the parking lots ? The Shanghai International Tourism and Resorts Zone, which encompasses the Shanghai Disney Resort, has 7 parking lots, including the Disney Parking Lot, and P1, P2, P3, P4, P5 and P6, providing a total of 10,668 parking space. The Disney Parking Lot and P1, which are relatively closer to the resort, are usually full before 10am. There are two emergency parking lots on Tanghuang Road, Zhoudeng Road, and Sunshine Avenue, totally providing 8,000 parking places. How much is the parking fee ? The parking fee varies. For 30 minutes, there is no charge. P5, P6: 60 yuan/ time. Can visitors ride e-bikes there ? For security reasons, visitors cannot bring e-bikes to the resort, but they can park them on Tanghuang Road and Sunshine Avenue. Shanghai Daily - 12 juin 2016. Residents of Shanghai and nearby cities have been looking forward to Thursday’s official opening of the sixth Disney theme park worldwide, but they know the tickets, meals, hotel accommodation and souvenirs won’t be cheap. It will cost a couple and a child around 2,600 yuan (HK$3,075) to spend a day at the Shanghai Disney Resort, 42 per cent more than the average monthly disposable income on the mainland last year. A family wanting to spend a weekend at the resort – two days of touring its attractions with a night’s stay at one of its hotels in between – will have to stump up at least 7,000 yuan, more than the average monthly income in Shanghai. Unlike its Hong Kong counterpart, Shanghai Disneyland offers two types of tickets: one for peak times – weekends, public holidays and the summer months of July and August – and the other for ordinary periods. The peak period ticket is priced at 499 yuan for a one-day visit and 950 yuan for two days, while entry during non-peak periods will cost 370 yuan for a one-day visit and 700 yuan for two days. Children are offered a 25 per cent discount. A one-day ticket for Hong Kong Disneyland costs HK$539, and a two-day one HK$739. Some restaurants inside and next to the Shanghai Disney Resort were not open when trial operations began on May 7 but many of the small group of people invited to experience the park’s attractions that day complained that the ones that were open charged a lot and didn’t serve very appetising food. The Beijing Youth Daily reported that the cheapest set lunch and dinner menus started at 70 to 80 yuan a head, with one two-person menu costing 250 yuan. At a souvenir shop, a White Snow princess skirt will cost 498 yuan and an Anna or Elsa doll from the film Frozen 326 yuan. A Mickey Mouse bag costs 342 yuan. A couple with a child would be more likely to visit on a weekend, so tickets for a day would cost them 1,373 yuan. Their food and drink bill is estimated at 800 yuan, with another 500 yuan for souvenirs, taking the total for the day to 2,673 yuan. Mainlanders’ average disposable income last year was 21,966 yuan, or 1,830 yuan a month, according to the National Statistics Bureau’s annual statistics. Cindy Zeng, a Shanghai mother, said her family would visit Disneyland sooner or later because her seven-year-old daughter was a fan of Disney characters like Minnie Mouse and Pluto. They visited Hong Kong Disneyland in 2013 and thought the prices there were not exorbitant. “A Mickey-Mouse steamed meat bun cost 35 yuan … that’s more expensive than Tokyo Disneyland!” one mainland netizen who visited the park complained. SCMP - 12 juin 2016. There’s nothing Mickey Mouse about Shanghai Disneyland’s expected impact on the city given the level of enthusiasm ahead of the US$5.5 billion theme park’s official opening on Thursday. The theme park, the latest world-class mega project in the mainland’s most developed city, is part of Shanghai’s quest to be counted among the world’s great metropolises. It’s expected to boost the city’s gross domestic product by 0.8 per cent directly and by double that amount once visitors’ ancillary spending is factored in. But He said the gargantuan entertainment project could also sate mainlanders’ appetite for cultural products. That’s prompted other experts to sound alarms about the park’s cultural impact. Shanghai’s chauvinism and grand ambition to transform itself into a global financial centre have made it an easy target for criticism in the past decade. The city has made only slow progress in implementing financial liberalisations, while its much-hyped free-trade zone, touted as a Hong Kong-style free marketplace, has disappointed foreign businesses due to a lack of substantive policies. But for Shanghai’s 25 million residents, Disneyland is more than a grand plan to make the city an international centre of everything. Full-throated praise of Mickey Mouse’s move into Shanghai can often be heard on the city’s streets, with residents avidly looking forward to a taste of the top-quality entertainment attractions offered by the world’s most successful theme park operator. And the target market for Shanghai Disneyland, Walt Disney’s sixth such project worldwide, is even bigger: the 330 million people living in the Yangtze River Delta, within a three-hour drive of the park. They have become more affluent in recent years and are used to splashing out thousands of yuan on entertainment activities such as movies, musicals and pop music concerts. Murray King, Shanghai Disney Resort’s vice-president of public affairs, said in late May that tickets for the first two weeks following the park’s official opening had been sold out and it would take measures to control crowds. It has been estimated that Shanghai Disneyland, covering an area of about 4 sq km, will receive 15 million visitors a year. A daily ticket to the theme park will cost 499 yuan during peak times such as holidays and weekends and 370 yuan on other days, and analysts predict visitors’ per capita spending, including souvenir purchases and hotel stays, will top 1,300 yuan. That projected spending would translate into annual sales of 19.5 billion yuan of annual sales, 0.8 per cent of Shanghai’s GDP, while bullish analysts forecast the park could generate total economic output of more than 40 billion yuan including non-local tourists’ spending on other products and services in Shanghai. Liu Zhengyi, deputy director of the 24.7 sq km Shanghai International Tourism and Resorts Zone’s administration commission, said Disneyland was just one of the projects planned for the zone, part of the city government’s plan to develop a world-class tourist destination and create a new growth engine for the local economy. However, the Shanghai Disneyland project, approved by the city government in 2009, has also attracted doubts about its profitability and criticism for being a Western cultural implant. Wang Jianlin, one of China’s richest men and the chairman of Dalian Wanda Group, a Chinese property-to-entertainment conglomerate planning a string of rival Wanda City theme parks, told state broadcaster China Central Television in late May that he thought Shanghai Disneyland would struggle due to hight prices and bad weather. “With the existence of Wanda, Shanghai Disney won’t be able to post profits in 20 years,” Wang said, adding that Shanghai’s summers were too sultry and its winters too chilly for outdoor entertainment activities. However Professor He disagreed, predicting Shanghai Disneyland park would recoup its investment in about 12 years based on projected visitor numbers and estimates of their spending. The Disney resort, including the theme park and other commercial complexes, is 57 per cent owned by the city government, with Walt Disney holding the rest, while the US media and entertainment giant has a 70 per cent stake in its management company, with the city government owning 30 per cent. Professor Zhou Lingqiang, a tourism management specialist at Zhejiang University, said Shanghai Disneyland also carried enormous cultural implications. “With the opening of the park, the Disney culture will reach a new high on the mainland as by-products such as films and animation will soon follow,” Zhou said. Disney has been accused of force-feeding homogenised culture to international markets, with Disneyland Paris, created in the early 1990s, widely regarded as it biggest failure, partly due to cultural differences. But there has been little opposition to Shanghai Disneyland from the Chinese public, and the few who have spoken out against it have been widely criticised. Mainland actor Sun Haiying used the weibo microblogging platform last year to urge internet users not to visit the park as it represented “sheer American values”. He also asked the Ministry of Education to tell students not to go to Disneyland, only to reap mocking comments that he should never leave his own country. His weibo account was among a number of high-profile accounts shut down by the authorities earlier this year for “misleading” remarks that had “very bad impacts”. Professor Yang Yang, from East China Normal University, warned the younger generation would grow up lacking memories of Chinese cultural symbols if Mickey Mouse and Donald Duck were all they were exposed to. But Professor He said Disney would help officials and people understand what culture was. “To put it in a simple way, culture is the products and services that can make people happy,” he said. Whether Shanghai’s drivers will be happier after the park opens has been called into question, with the influx of visitors likely to make the roads in and near the city even more congested. A report by Shenwan Hongyuan Securities Strategy said a “conservative estimate” of 10 million visitors to Disneyland a year would increase the number of passengers being transported in the city by 3 per cent to 5 per cent. And with growing demand for inter-city services such as buses and high-speed trains, Disneyland tourists would spend roughly 4 billion yuan a year on transportation in the Yangtze River Delta region, it said. Metro line 11 has been extended to the theme park and Shanghai has also built eight roads leading to the resort and a public transport junction designed to tackle the heavy traffic. But the authorities are still bracing themselves for serious congestion, especially on weekends and public holidays, and have advised visitors to use public transport to avoid traffic jams. Yang Xiaoxi, deputy director of the municipal transportation committee, told a press conference last month that the authorities would release information about congestion across the city regularly to guide traffic flows and would also coordinate with the highway management departments in neighbouring Zhejiang and Jiangsu provinces. The metro station would limit the number of people boarding trains by setting up waiting areas and putting on more buses when needed, Yang said. Ten new bus lines, including ones connecting the resort with two railway stations and two airports, will go into operation this month. The resort would bring Shanghai hotels more customers during traditionally slack seasons for expositions and trade shows, said Ma Jing, senior director of revenue management at Shanghai-based yield management consulting firm Hong Que. Such commercial events usually took place on weekdays in spring and autumn, while the peak visiting periods for Disney were expected to be the summer and winter vacations, and weekends in spring and autumn. Hong said that could see occupancy rates at Shanghai hotels rise by five percentage points in the second half of the year. The room occupancy rate last year at Shanghai hotels covered by the government’s star rating system was 65.6 per cent. The benefits could spread wider still, with the Shenwan Hongyuan Securities Strategy report saying the “Disney frenzy” would focus more attention on theme parks in general, with domestic parks set to benefit. China has been on a theme-park-building spree in recent years, with a recent report by the Qianzhan Industry Research Institute saying every province or directly controlled municipality is now home to at least 20 theme parks. Wanda opened the first of 15 to 20 planned Wanda City theme parks around China in Nanchang, Jiangxi province, late last month, only to be accused by Disney of infringing upon its intellectual property by featuring some its cartoon characters. Wanda replied that the characters had been used in promotions by stores in a shopping mall attached the theme park and their use had been officially licensed by Disney. Shenwan Hongyuan Securities Strategy said in its report that the sale of souvenirs based on its cartoon characters was a major advantage for Disney, estimating total sales on the mainland at more than US$13 billion. That would only increase with the opening of Shanghai Disneyland, it said. Les temps d'attente élévés pour accéder aux attractions inciteront-ils certains à privilégier Hong Kong Disneyland Resort malgré la taille réduite de ce dernier par rapport à Shanghai Disneyland ? After four-hour queues during trial run, will Shanghai Disneyland’s lengthy lines send tourists to Hong Kong instead ? Thursday’s official opening of Shanghai Disneyland might not be bad news for its Hong Kong counterpart. The Hong Kong theme park reported a loss last year, the first since 2011, on a 23 per cent slump in mainland visitors. However, that means its queues are now shorter, and that could appeal to some mainlanders who have expressed dissatisfaction with the long lines encountered at attractions in the Shanghai park during the past month of trial operations. Some visitors had to queue for up to four hours for the most popular attractions and said they would consider visiting the Hong Kong park instead – even though it’s only a third the size of the Shanghai one. “The biggest impression for me [of Shanghai Disneyland] is too many people. I think this is the most painful part of this resort,” said Martin Guo, who visited the park with his wife, their 18-month-old daughter and his mother-in-law on May 29. He said he was impressed with the attractions, fireworks show and parade, but his family had to queue for between 20 minutes and two hours to get into rides and shows. An online survey by polling group Horizon found that 94 per cent of people would be reluctant to queue for more than an hour for any attraction. 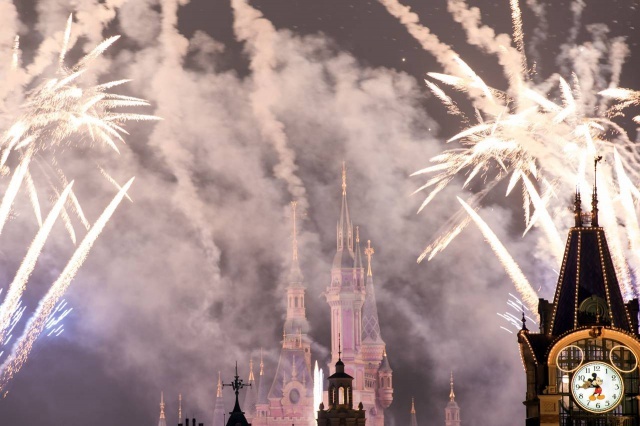 Nearly 30 per cent of those surveyed, using a smartphone app, said they would consider going to the Hong Kong or Tokyo Disneyland theme parks instead, while 50 per cent said they had no intention of visiting any Disneyland in the next six months. Cheng Xiaojing, an office assistant in Shanghai, said one of her friends had told her he had queued for three hours for the Soaring Over the Horizon attraction only to be told by resort staff that the equipment had malfunctioned. Carina Fan, who manages a China International Travel Service branch in Shanghai’s Pudong district, said plane and hotel prices for travel to Hong Kong were far cheaper than before because the city had become less attractive to mainlanders. “Years ago it was easy for agencies to organise 20 groups each month, but now it’s only several groups a month,” she said. However, not everyone dislikes queuing. Vivian Wen, a finance worker in Shanghai, said she and three friends planned to take their children to Shanghai Disneyland at the end of this month once their school exams were over. The acrobats are practicing their flips. Chefs are learning to cook dumplings by the thousands. And invited guests are test-driving the Tron Lightcyle Power Run, a roller-coaster that races through a fluorescent space landscape at 60 miles per hour. 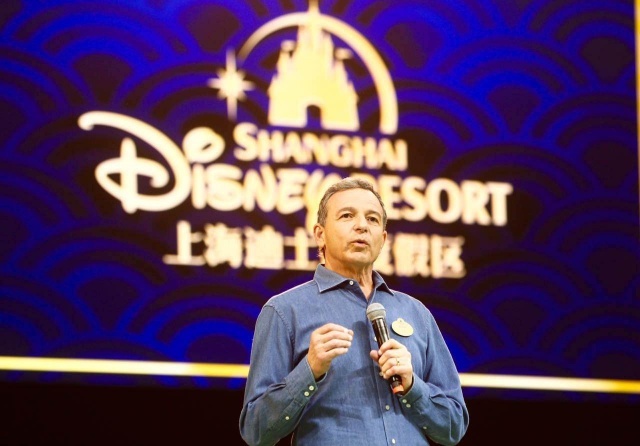 All systems are go for the June 16 opening of the $5.5 billion Disney Shanghai Resort, the largest foreign investment ever from the world’s biggest theme-park operator and a career milestone for Walt Disney Co. Chief Executive Officer Bob Iger. If history is a guide, however, the opening could be as turbulent as the twists and turns on Big Thunder Mountain. Disney’s past international park efforts have been marked by cultural missteps and years of losses. Shanghai represents a chance for the Burbank, California-based company to avoid those mistakes and earn a profit commensurate with the money it’s investing. In an interview with Bloomberg TV in Shanghai on June 9, Iger said the new park’s size, commitment to technology and focus on local culture distinguish it from prior efforts. Disney has taken steps to win over Chinese consumers. Chinese zodiac symbols combine with Disney characters at a central garden in the 963-acre resort. A giant tea house sits at the foot of the castle, the tallest of any Disney park. An app will let guests buy tickets and check wait times on rides. Disney’s resorts division began taking steps overseas with Tokyo Disneyland in 1983. Construction of the first park there ran about 80 percent over its 100 billion-yen budget. But the company was insulated. Card Walker, CEO at the time, had endured kamikaze attacks on his aircraft carrier in World War II and was reluctant to invest directly in Japan, according to “Dream it! 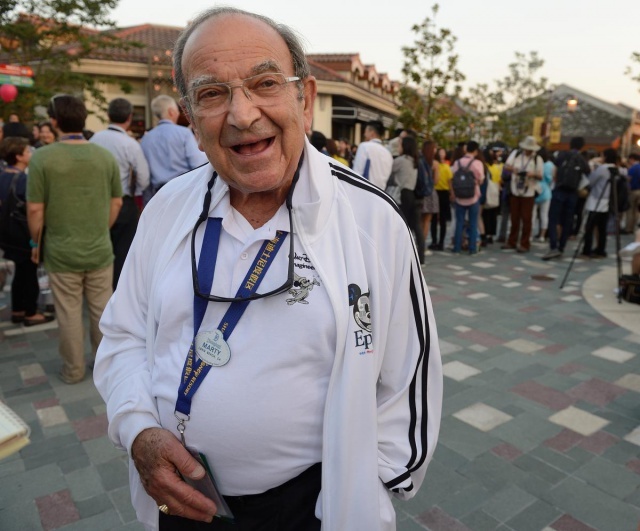 Do It!,” a 2013 autobiography by Disney parks designer Marty Sklar. So he signed a licensing deal with Oriental Land Co., which funded and owns what is now two parks in Japan. Oriental Land earned $692 million last year on sales of $4.4 billion. Disney collects a royalty that amounted to $366 million in fiscal 2015, much of that profit. Things haven’t gone so well at the company’s other international resorts. Euro Disney SCA, the publicly traded owner of the two parks at Disneyland Paris, has been bailed out three times in three decades -- with the U.S. company lending a hand each time -- and hasn’t made a profit since 2001. Disney has a 77 percent stake in that company. Among the problems: Europeans didn’t stay overnight or spend on merchandise like their American counterparts, meaning too many of the 5,800 rooms at seven hotels were empty. Disney also took a beating in the local press for perceived cultural imperialism, such as serving too much American food, said Lee Cockerell, who supervised restaurants at Disneyland Paris on opening day and is now retired from the company. “We were overstaffed from the beginning,” Cockerell said. Hong Kong Disneyland, a 47 percent-owned venture with the local government, has been unprofitable for eight of its 11 years, including 2015. The smallest Disney resort at 310 acres, Hong Kong was hurt by a decline in mainland Chinese tourists last year, according to its annual statement. The resort lost $19 million on sales of $659 million. Disney hasn’t shown a profit on its international theme park investments since the company began breaking out the business in 2004, according to filings. The results since 2011 include the still-under-construction Shanghai resort, as well as Hong Kong and Disneyland Paris, though not Tokyo. 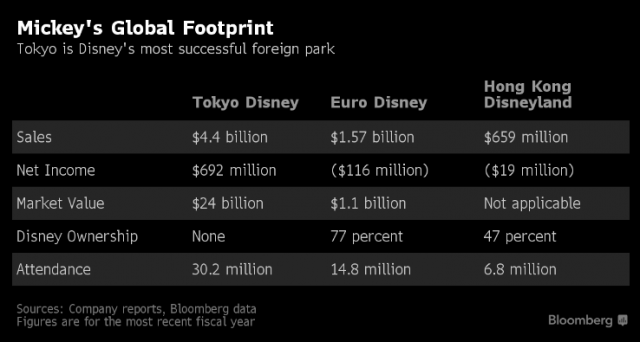 Disney has invested $6.7 billion in its international parks over the past 10 years, according to filings, with about half from local partners. Disney and its Chinese partners are financing two-thirds of the Shanghai resort with equity and borrowing the rest. The company has already endured criticism on social media for its Shanghai prices. Though the lowest in Disney’s empire, they are high by local standards. Admission on weekends and other peak periods is 499 yuan ($76). On other days it’s 370 yuan ($56). Chinese billionaire Wang Jianlin, who is opening a string of his own theme parks in the country, has said he will come after Disney like a pack of wolves on a tiger. Iger said he’s not concerned. Disney estimates 330 million potential guests live within three hours of the park. That, combined with the low cost of doing business in China and Disney’s support from the government there, means the resort could be more profitable than Tokyo, said Crockett, the FBR analyst. He predicts the resort will break even in two years and generate more than $200 million in operating income by fiscal 2019. Macquarie Capital analyst Tim Nollen estimated it will earn $185 million before interest and taxes by then on revenue of about $2 billion and attendance of 15.7 million. Disney has said only that the park won’t be profitable this year. Expenses before the opening will reach $300 million. Tickets for the June 16 opening day were sold out on within hours of it being offered for sale online in March. On Tuesday, Disney will hold a a red-carpet premiere of the Mandarin-language version of the Broadway musical, “The Lion King,” with attendance expected by local and international celebrities. The payoff from a stronger presence in China could go beyond the park to include Disney’s other businesses, like film and TV. Iger plans to have a Disney-branded movie in production in China within a year. The presence of the park, he said, will boost sales of Disney merchandise and U.S.-made films in the country. “There’s a lot of growth ahead in the years ahead, the decades ahead, maybe even the centuries ahead,” he said. Christopher Palmeri pour Bloomberg - 13 juin 2016. Photo : Qilai Shen / Bloomberg News. SHANGHAI—Walking around his company’s newest, most expensive, and highest-stakes theme park on its last day of testing here Saturday, Walt Disney Co. Chief Executive Robert Iger saw only one thing he wasn’t happy about. “We’re scrambling to put in more seating and shade,” Mr. Iger said, pointing to dozens of people sitting on the floor inside the Enchanted Storybook Castle at the center of Shanghai Disneyland to escape shirt-soaking heat. The CEO of the world’s largest entertainment conglomerate doesn’t typically get involved in the minutiae of his company’s projects, but he is making an exception for the Shanghai Disney Resort, a theme park, hotel and shopping complex whose construction costs have exceeded $5.5 billion. Mr. Iger has taken an interest in everything from the landscaping (not enough plants) to the entertainment (urging designers to replace a show that wasn’t working with one based on “Frozen”) to lines as long as three hours (visitors here often stop to take pictures, he noted, when a ride is supposed to start moving). The park officially opens Thursday at a time when China’s economic growth is the slowest in decades, as the government struggles to close factories and lay off workers without setting off social unrest. 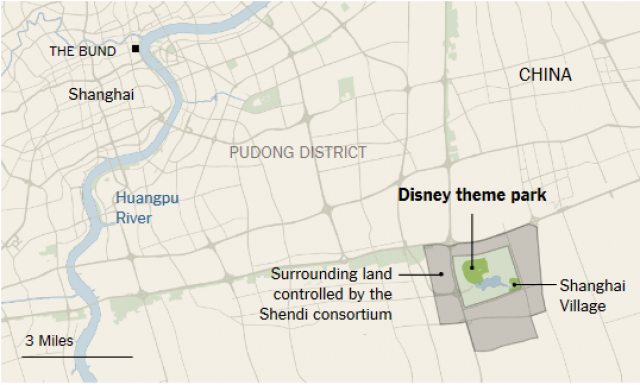 Disney owns 43% of Shanghai Disney Resort, with the majority controlled by the local government’s Shanghai Shendi Group Co. While the most recent cost projections for the resort were for $5.5 billion, Mr. Iger allowed that the final cost had risen. He declined to specify by how much, saying the difference was “nonmaterial.” Shanghai Shendi has said 10 million people will visit in the first year, though analysts say it could be as many as 15 million. In the years to come, Mr. Iger said, success in Shanghai could help boost Disney’s resonance in the world’s most populous country. The company’s research has shown that while the brand’s strength has grown here in recent years, it underperforms much of the world in appreciation and knowledge. And as those numbers grow, Mr. Iger noted, Disney should be able to sell more merchandise, particularly online, and launch new digital businesses. Selling consumer products and food in its parks has always been important to Disney’s business as well, which may not prove easy in China. Stores such as the Be Our Guest Boutique and the Avenue M Arcade were packed with people browsing, but lines to actually buy products such as Mickey ears for 155 yuan (around $24) or a Snow White dress for 479 yuan (around $73) were short. Some visitors said they didn’t mind the prices for theme-park tickets ($56 to $76) but were put off by the prices for products and food at Shanghai Disney Resort shops. “All the things are too expensive, much more expensive than outside,” said Li Chunhua, visiting with her husband and 8-year-old son. The only product they bought for their son, she said was a 45 yuan ($7) fan. Many Chinese noted that Disney products can easily be found on shopping websites such as Taobao for a fraction of the price at the park, though not all are officially licensed by the company. Mr. Iger said merchandise sales in the park have so far been “robust” and have met expectations, adding that Disney is also looking to sell more of its licensed products online. Lines for many restaurants and food stands were short as well, save for turkey legs, a popular staple at Disney’s U.S. parks. Shanghai Disneyland is the only theme park allowing visitors at launch to bring their own prepackaged food—a policy Hong Kong Disneyland adopted after opening. “We made a decision in quick service [food] to go high quality and higher price,” said Mr. Iger. “I think what’s going on is people go into a quick-service restaurant and don’t expect that quality or price.” Still, he said Disney is in “fine shape” in terms of food spending and noted that while Chinese cuisine is still the most popular at the park, Western offerings such as hamburgers have proven twice as popular as the company had expected. More immediate, he said, are plans to expand Shanghai Disney Resort, for which the company has the ability to triple its current size. That could include new areas within Shanghai Disneyland or even a second park on the premises, either of which could potentially focus on brands popular in China that currently have a small presence, such as Marvel superheroes. Ben Fritz pour The Wall Street Journal - 12 juin 2016. Photo : Kim Kyung-Hoon / Pool / European Press photo Agency. If Shanghai Disneyland is Robert Iger’s baby, he’s a very proud and very exhausted parent. Walking through the theme park on Saturday, the last day of testing before it opens to the world Thursday, the Walt Disney Co. chief executive beamed as he noted details ranging from paintings inside the Enchanted Storybook Castle to the lush landscaping to the visceral thrill of TRON Lightcycle Power Run, which he rode with a reporter. While he gamely posed for photos with tourists who recognized him from television interviews, Mr. Iger admitted he was on the verge of exhaustion after constant shuttling back and forth to China during the past few months and overseeing nearly every detail in a $5.5 billion-plus project that likely will be remembered as his greatest legacy at the company. WSJ : What are some of the most interesting things you’ve learned during your test runs of the park during the past month? Iger : I haven’t seen one false note besides too many people sitting in the shade. We’re scrambling to put in more seating in the shade. What we’ve found on food has been surprising. We expected Western food would be about 10% of demand. It’s running double that—hamburgers, pizza, turkey legs, corn dogs. That’s something you can’t possibly know going in. WSJ : The lines are pretty significant. At the “Pirates of the Caribbean” ride, it was three hours. WSJ : The lines could get shorter as the park gets bigger? Iger : We’re already building to expand. We haven’t said what it is, but we have a lot of room to expand. WSJ : It’s kind of surprising that one of your biggest rides here is based on “TRON,” when that latest movie wasn’t a major hit. Iger : People have asked about that. Our Imagineers [theme park designers] were developing a new ride technology: motorcycle-like vehicles on a track. We were really blown away by the technology but had no idea how we would use it. Then the “TRON” movie came out and the light cycles reminded us of how cool those vehicles were. When we were thinking of what we would anchor Tomorrowland with here, the lightbulb went off. It’s not just about bringing the best [intellectual property] here, it’s about building the best experiences. WSJ : Is this a tough time to open a theme park with the Chinese economy slowing? Iger : You’re entering a market that’s huge. No matter what’s said about growth rates slowing, this is still a developing market. So that means the future is brighter than the present or past. You also have a market where time spent on entertainment is growing. Just look at what’s happening in the movie business or the boom in theme parks. There’s the desire to transition the economy from a manufacturing economy to a service economy. And then you have growth in tourism within China. When you add all of that up, then you overlay the fact that our IP is entering this market much more effectively because of our movies; you get a combination of factors that are a tremendous opportunity. WSJ : You must have done a lot of research on where the Disney brand stands right now in China. Iger : We’ve done a tremendous amount of research. We’ve grown tremendously here in the last five years. Marvel in particular has. But if you look at big markets across the world, this is way below. We underperform in appreciation and knowledge. This’ll change that. WSJ : What did you learn in the process of building this park during the past five years? Iger : I think the biggest learning was that we were building something not only huge, but far more complex than the Chinese construction industry in general is used to. We were also educating them [about] what they were building. We were not just building a cookie-cutter hotel where floor after floor is the same. I’d say we overestimated the ability for them to understand how complex it would be to build this. That ended up taking not only a little bit more time, but a little more supervision. If there was concern or frustration, it was along those lines. We overcame it. WSJ : Where do you see Disney expanding in China? Iger : In digital media. I think that will come. Movies will continue to grow. A lot of people have speculated this could be an interesting cruise ship market. Is there another city [with a theme park]? It’s too early to tell, but the answer is, I think there is. We’re not in any rush. We’ve got this thing—we’re going to open and expand. Photo : Johannes Eisele / Agence France-Presse / Getty Images. Thursday’s grand opening of the $5.5 billion-plus Shanghai Disney Resort won’t just give Walt Disney Co. a flagship in its most important market outside the U.S., but also a chance to shore up its foreign theme-parks business, one of its few weak spots. While annual revenues from the media giant’s parks in Florida and California have surged 46% over the past five fiscal years to $13.6 billion, those in France, Hong Kong and Japan have been nearly flat at around $2.5 billion. Analysts expect the Shanghai Disneyland theme park and its two hotels to lose money in their first few years but ultimately to boost the international theme-park business’s bottom line. They also point to a larger potential. Although the Tokyo park’s performance has been relatively strong, the other two have struggled with problems of their own, as well as broader economic and political factors, including November’s Paris terrorist attacks. Overall, Disney’s parks and resorts business reported operating income of $3.03 billion last fiscal year. But, according to research firm MoffettNathanson, the overseas parks, which the company doesn’t break out in its results, had an operating loss of $45 million last year, in part because of spending on the Shanghai project. The firm estimates that their operating profit peaked at $179 million in 2011. Disney owns a majority stake in Disneyland Paris and a minority stake in Hong Kong Disneyland. It has no equity in Tokyo Disneyland, from which it gets licensing fees. 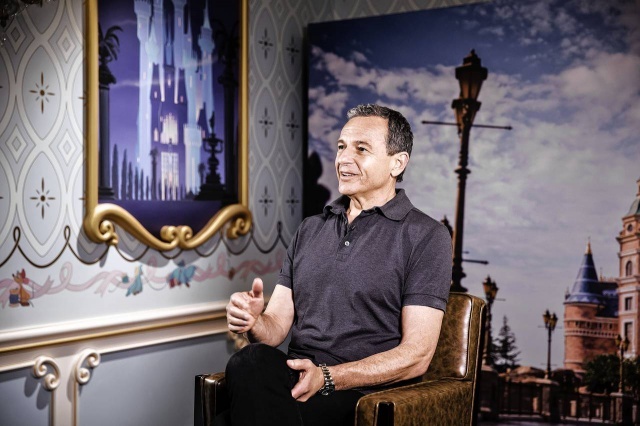 Disney Chief Executive Robert Iger has said for years that he sees the Shanghai park as more than a compelling economic opportunity in the largest city of the world’s most populous country. “As Walt did with Disneyland in the ’50s, enabling Disneyland to really grow the Disney brand in the United States, we believe we will have some really interesting opportunities to do the same in China,” Mr. Iger told an investor conference in 2009, soon after gaining a key approval from the Beijing government. Disneyland Paris has been plagued by problems since its 1992 opening, struggling to strike a balance between Disney values and European tastes. Its corporate parent, Euro Disney SCA, hasn’t reported a profit since fiscal 2008. Attendance at the park hit a high of 16 million in fiscal 2012, then fell to 14.2 million in 2014 and 14.8 million in the past fiscal year. A new ride based on the film “Ratatouille,” from Pixar Animation Studios, failed to overcome the damping effect of Europe’s economic slowdown. In an attempt to bolster the park’s finances, Disney last year injected €420 million ($477 million) of new capital into Euro Disney and converted €600 million of Euro Disney debt into shares. In the process, it increased its stake in the French park to nearly 77% from 40%. In Hong Kong, where Disney’s park opened in 2005, attendance was initially lower than expected because of the park’s relatively small size and scarcity of appealing rides. But Hong Kong Disneyland has expanded over time, and reported its first net profit in 2012. That profit grew to HK$332 million (US$42.7 million) in 2014. Last year, however, the park slipped back into a loss, which the company attributed to overall softness in Hong Kong tourism. Attendance dropped 9% to 6.8 million. Hong Kong Disneyland could get a lift later this year when it opens an “Iron Man” ride, the first at any Disney park based on a Marvel superhero. A new hotel also is under construction, a sign the company believes attendance will grow again. But the opening of the new Shanghai park could siphon off visitors from mainland China, who accounted for 41% of the Hong Kong park’s attendance in 2015. 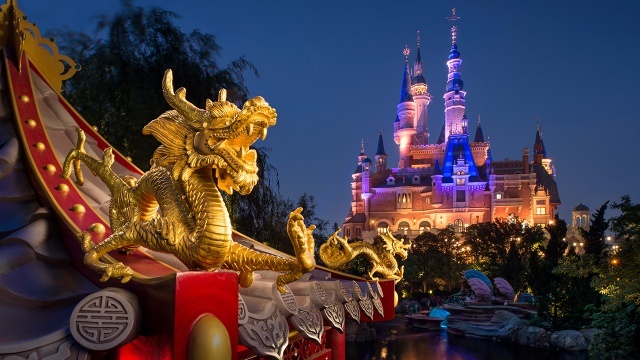 That is one of many unknowns that make it difficult to predict what effect the Shanghai park will have on Disney’s performance, said Barclays analyst Kannan Venkateshwar. Disney has said there are about 330 million “income qualified” people living within three hours of Shanghai Disneyland, leaving more than enough potential visitors for both parks, which are separated by 760 miles. It also isn’t clear how much Chinese consumers would be willing to spend on food, toys and other concessions during visits to the Shanghai park, where ticket prices range from $56 to $76. That compares with $105 to $124 at the Magic Kingdom at Walt Disney World in Orlando, Fla. Average spending per visitor at other international Disney parks, said Mr. Venkateshwar, is lower than in the U.S.
Barclays projects that Shanghai Disneyland will draw 12 million visitors in its first year, while Nomura puts the figure at 15 million. State-backed Shanghai Shendhi Group, which owns 57% of the Chinese theme park, has said it expects 10 million. Disney, which owns the other 43%, hasn’t offered an estimate. The Magic Kingdom drew 20.5 million people last year, according to a report from the Themed Entertainment Association and consulting firm Aecom. Mr. DiClemente of Nomura said that once Shanghai Disneyland is up and running, it could generate as much as $500 million in operating income a year. MoffettNathanson expects the park to reach that milestone by 2021. Beaucoup de questions posées à Iger sur la longueur des files d'attente. Est-ce que quelqu'un sait quelle est la capacité en nombre de visiteurs journaliers du parc ? Le journaliste Keith Sharon et le photographe Jeff Gritchen sont partis en Chine pour couvrir l'ouverture de Shanghai Disneyland. Est-ce que il y aura un moyen de regarder la cérémonie d'ouverture en direct depuis la France ? The Walt Disney Company is proud to celebrate the opening of Shanghai Disney Resort, the first Disney resort in Mainland China and the sixth Disney resort worldwide. A three-day grand opening celebration commemorates the culmination of one of the largest foreign investment projects in China's history, and Disney's largest investment to date outside of the United States. The resort's opening is the result of a long collaborative relationship with the Shanghai Municipal Government and joint venture partner Shanghai Shendi Group, and offers a new world-class tourism destination for guests from China and around the world. At opening, the first phase of the resort is within a land area of 963 acres with additional land available to accommodate future expansion, including additional theme park and other related resort development. "The grand opening of Shanghai Disney Resort is one of the proudest moments in the history of The Walt Disney Company, and we've planned a truly spectacular celebration worthy of this historic achievement," said Bob Iger, chairman and chief executive officer, The Walt Disney Company. "Just like the park itself, the next three days will be a grand experience filled with great joy and excitement along with stunning entertainment experiences. We are honored to be joined by so many distinguished guests for this momentous occasion, and look forward to officially opening the gates and sharing this extraordinary authentically Disney, distinctly Chinese destination with the world." The three-day celebration begins on June 14 with the global premiere of the first Mandarin production of the Broadway hit THE LION KING at the 1,200-seat Walt Disney Grand Theatre in Disneytown. 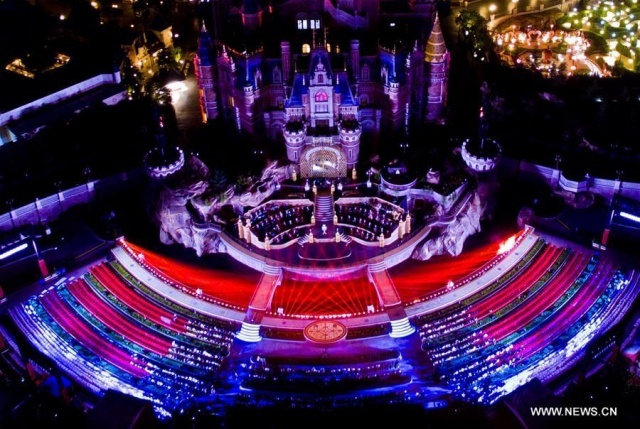 It continues on June 15 with a grand opening gala concert at the Enchanted Storybook Castle led by award-winning composer Tan Dun, known for film scores including "Crouching Tiger, Hidden Dragon" followed by a Starlight Celebration dessert party in Tomorrowland. On June 16, there will be a festive dedication ceremony in front of the Enchanted Storybook Castle to officially open Shanghai Disney Resort to guests. 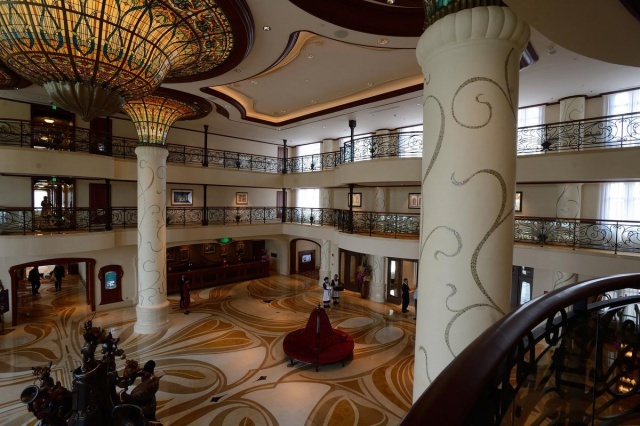 Shanghai Disney Resort is a first-of-its-kind resort that combines the very best of Disney in a way that is distinctly Chinese and tailor-made for the people of China. At opening it features a newly designed Magic Kingdom-style theme park, Shanghai Disneyland, with six themed lands filled with immersive attractions, including Adventure Isle, Gardens of Imagination, Mickey Avenue, Tomorrowland, Treasure Cove and Fantasyland. These lands are located around the iconic Enchanted Storybook Castle, the tallest, largest and most interactive castle at any Disney park. The resort also features world-class live entertainment, two exquisite hotels, a shopping, dining and entertainment district called Disneytown and a 98-acre recreational area called Wishing Star Park with a lake that is open to the public. The resort showcases Disney's industry-leading practices, including quality and safety standards, the introduction of new innovative technologies, and operational best practices -- all of which contribute to the overall theme park industry and the development of Shanghai's tourism industry. It is a result of years of collaboration and innovation, with contributions from Disney cast members and Imagineers, as well as thousands of artists, designers, construction workers and suppliers from across China and around the world. Shanghai Disney Resort broke ground in 2011. In April 2014, the resort's shareholders jointly announced an accelerated expansion plan to capitalize on the tremendous growth in China's tourism sector – adding more attractions, entertainment and other offerings to increase capacity at the theme park on opening day. Throughout its development, Shanghai Disney Resort aimed to not only build a world-class tourism destination, but also serve as a valuable community partner and active corporate citizen in Shanghai and China. Working within the community, the resort provides support to address a wide range of needs for children while creating opportunities to strengthen relationships with the important adults in their lives. Last week, in honor of the grand opening of Shanghai Disney Resort, The Walt Disney Company announced a $3.1 million USD (RMB 20 million) donation to support the creation of Disney-themed play spaces in 50 children's hospitals throughout China. Shanghai Disney Resort also adopted a number of new technologies and design elements to enable Shanghai Disney Resort to reduce its environmental impact, including a leading new technology to supply the resort with heating, cooling and compressed air, which is anticipated to improve the estimated energy efficiency for resort operation by 300 percent and reduce greenhouse emissions generated from resort operations by 60 percent. Additional information is available at www.shanghaidisneyresort.com, the destination's official website for news and information. The Walt Disney Company / Walt Disney Parks and Resorts - 13 juin 2016. 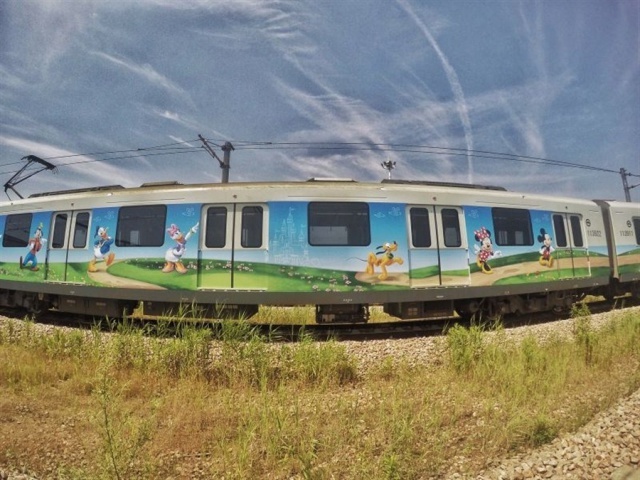 TWO theme trains featuring Disney characters are ready to serve. They are set to leave from the Disney Resort and Luoshan Road stations at noon at the same time on Thursday, the opening day of Shanghai Disneyland, local Metro operator said today. 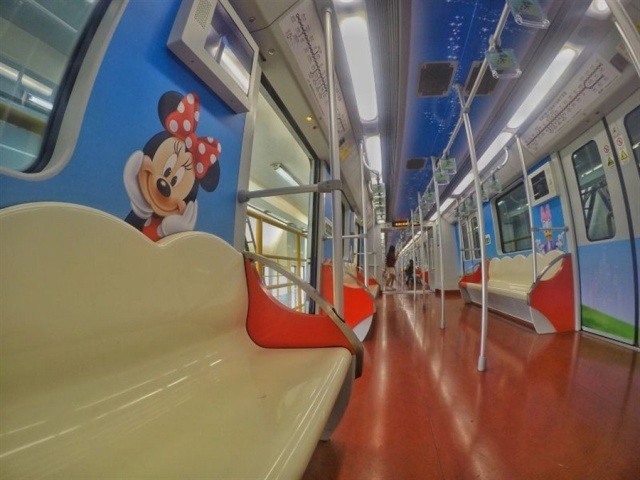 Riders will find elements of famous characters such as Mickey, Minnie, and Donald Duck greeting them boarding the trains. The trains have been decorated with giant stickers featuring these characters. There would only be this pair of trains servicing on the stretch of the last four stations on Line 11, which are the Luoshan Road, Xiuyan Road, Kingpin Highway and Disney Resort stations. Another two trains are planned to be added to increase capacity in future, said the operator. Shanghai Daily - 14 juin 2016. En france, non!A cause de la fameuse loi, qui interdit de faire la promotion d'une marque dans une émission télé. Sauf si tu as disney channel US ou en cherchant sur internet. The authorities in Shanghai have evicted hundreds of residents and dozens of businesses to clean up the air and make way for the newest Disney theme park, which opens on Thursday. Residents were paid for lost homes, but hundreds of employees of closed factories say they do not know where their next jobs will be. “You can find low-paying work, but jobs that pay better you can’t get,” said a 50-year-old equipment inspector at China Xingyue Group, which makes small utility vehicles and motorbikes. He would give only his surname, Chen. The story has been repeated thousands of times across China over the past two decades as the communist government removed farmers and small businesses for construction of factories, office towers, hydroelectric dams and other projects. The authorities who used to turn out residents with little compensation have got more sophisticated about smoothing the transition, but the outcome is the same: a community uprooted to make way for economic development. In the district near the Disney site, at least 153 factories have been ordered to close this year to cut pollution, according to the local government. Most are workshops that employ 10 to 20 people producing goods ranging from clothing to chemicals. Shanghai’s air pollution is not as bad as Beijing’s eye-searing smog, but regularly exceeds levels the World Health Organisation says are safe. 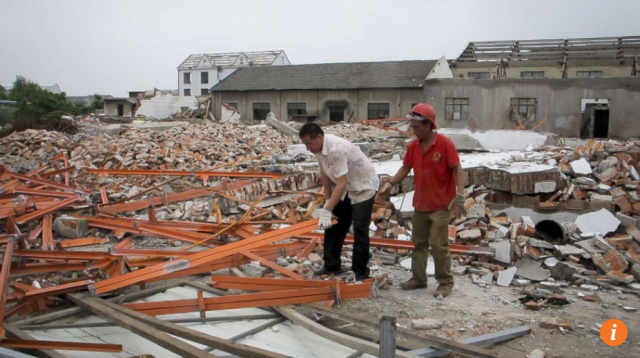 Qin Lijun’s home was demolished in 2013 to make way for Disney construction. She prefers her new, 70-square-metre apartment, one of three given to her extended family, where she lives with her dog, Harry. Xingyue Group plans to relocate its factory to neighbouring Zhejiang province, but some of its 200 employees have no plans to go along. Infographie : The New York Times. SHANGHAI — Disney had pushed China too hard, putting the company’s plans for a new theme park here in limbo. Now, Robert A. Iger wanted to kick the yearslong negotiations into high gear. Mr. Iger, Disney’s chief executive, took a corporate jet to Shanghai in February 2008 to meet with the city’s new Communist Party boss, Yu Zhengsheng. Over dinner at a state guesthouse, Mr. Iger offered a more conciliatory approach, setting the tone for the next phase of talks. After that, Disney substantially dialed back its demands. In addition to handing over a large piece of the profit, the control-obsessed company would give the government a role in running the park. Disney was also prepared to drop its longstanding insistence on a television channel. For Disney, such moves were once unthinkable. Giving up on the Disney Channel meant abandoning the company’s proven brand-building strategy. “We’re kidding ourselves if we think we’re going to get everything we want,” Mr. Iger recalled saying at the time. Mr. Iger’s trip and the new attitude in the talks that followed appeased Chinese officials. Before long, they had struck a landmark deal to build the $5.5 billion Shanghai Disney Resort, opening China to a singularly American brand and setting the pace for multinational companies to do business in the country. The Shanghai park, which opens on Thursday, has become mission critical for Disney as it faces business pressures in other areas like cable. 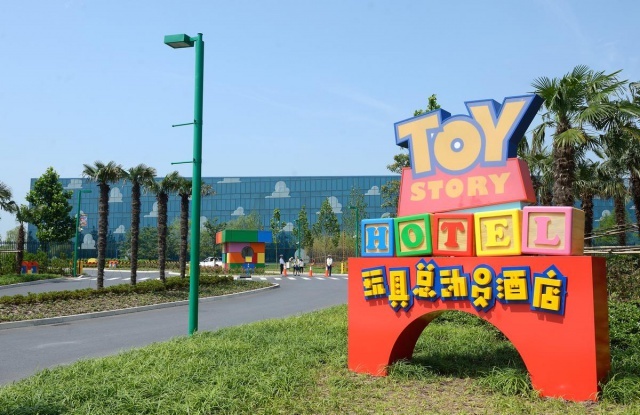 It is designed to be a machine in China for the Disney brand, with a manicured Magic Kingdom-style park, “Toy Story”-themed hotel and Mickey Avenue shopping arcade. More than 330 million people live within a three-hour drive or train ride, and Disney is bent on turning them into lifelong consumers. But Disney is sharing the keys to the Magic Kingdom with the Communist Party. While that partnership has made it easier to get things done in China, it has also given the government influence over everything from the price of admission to the types of rides at the park. From the outset, Disney has catered to Chinese officials, who had to approve the park’s roster of rides and who were especially keen to have a large-scale park that would appeal to more than children. The Shanghai resort, which will ultimately be four times as big as Disneyland, has a supersize castle, a longer parade than any of the other five Disney resorts around the world, and a vast central garden aimed at older visitors. Worried that importing classic rides would reek of cultural imperialism, Disney left out stalwarts such as Space Mountain, the Jungle Cruise and It’s a Small World. Instead, 80 percent of the Shanghai rides, like the “Tron” lightcycle roller coaster, are unique, a move that pleased executives at the company’s Chinese partner, the state-owned Shanghai Shendi Group, who made multiple trips to Disney headquarters to hash out blueprint details. Such accommodation of the Chinese is becoming increasingly common. A growing number of multinationals have agreed to cooperate with the state through alliances, joint ventures or partnerships, all in the hopes of garnering more favorable treatment and gaining access to the world’s second-largest economy, after the United States. And they are doing so at a time when the Chinese government is growing more assertive and nationalistic. Emboldened by the size and breadth of its economy, China is stepping up its demands, pressuring companies to lower their prices, hand over proprietary technology and help advance the country’s development goals, even if that means financing the growth of local rivals. IBM has promised to share technology with China. LinkedIn has agreed to censor content inside the country. Even Google has been scrounging for a way back into China, despite a highly public departure in 2010 after accusations of government censorship and intrusions by state-backed hackers. For Disney, if all goes as planned, the Shanghai park will create an ecosystem of demand in China for movies, toys, clothes, video games, books and TV programs. Mr. Iger has called Shanghai the “greatest opportunity the company has had since Walt Disney himself bought land in Central Florida” in the 1960s. That site, of course, became Walt Disney World, a group of four theme parks that attracts roughly 40 million visitors annually. About 11 million visitors are expected next year at the Shanghai park, with annual attendance estimated to reach 20 million within a few years, according to Jessica Reif Cohen, an analyst at Bank of America Merrill Lynch. If all doesn’t go as planned, Disney will suffer the wrath of Wall Street, which expects the resort to offset slower growth at ESPN, the company’s longtime profit engine, and some of its other theme parks. The last thing Disney wants is another Disneyland Paris, a money pit that suffered cultural miscues and, after 24 years, is still struggling to turn a profit. Hong Kong Disneyland, which is relatively small, has had mixed financial results since opening in 2005. Mr. Iger has staked his personal legacy on Disney’s partnership with the Chinese government. Last September, he brought a group of Disney board members to Shanghai to show off the park. They took in the world’s largest Disney castle, looking on as 11,000 construction workers raced to finish a “Pirates of the Caribbean”-themed underwater voyage. His signature is quite literally on the place: He autographed the castle’s golden spire before it was attached last year. 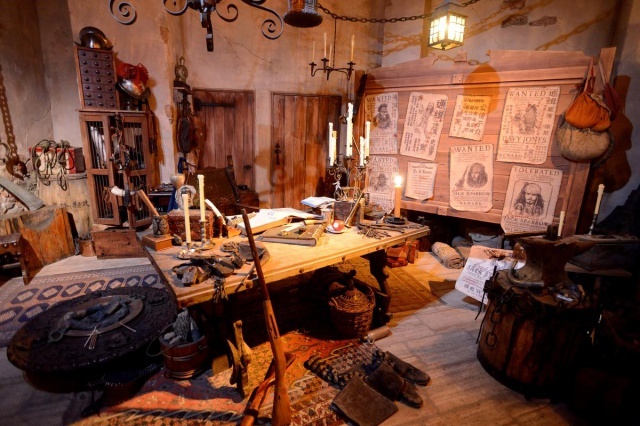 While he delegated certain duties to lieutenants, Mr. Iger has been the guiding force. He pre-tasted the food, which will include items like pork knuckles and Donald Duck-shaped waffles, and decided which characters would appear in the parade. He has held face-to-face talks with Chinese presidents, prime ministers and propaganda officials. Mr. Iger, 65, has sought a personal relationship with China’s paramount leader, President Xi Jinping. After Mr. Iger learned that Mr. Xi’s father, Xi Zhongxun, a revolutionary leader, had visited Disneyland in 1980, he pressed his staff to find a photograph. A color photograph shows the president’s father, who died in 2002, wearing a Mao suit, shaking hands with Mickey Mouse. Mr. Iger presented it to the Chinese leader as a gift and a symbol of their partnership. When Mr. Xi stopped in Seattle last September, Mr. Iger was among the American executives on hand to welcome him. At the White House state dinner a few days later, Mr. Iger was seated at Mr. Xi’s table. Just last month, Mr. Iger flew to Beijing to meet the president at the Communist Party’s leadership compound. It may be all smiles now, but Mickey Mouse knows all too well what can happen when the Middle Kingdom gets mad. As part of a now-defunct effort to make films for more sophisticated audiences, Disney agreed to back the director Martin Scorsese, who wanted to make “Kundun,” about China’s oppression of the Dalai Lama, the Tibetan spiritual leader. The Chinese government, which considers the Dalai Lama a separatist, denounced the project and pressured Disney to abandon it. “All of our business in China stopped overnight,” Disney’s chief executive at the time, Michael D. Eisner, recalled. Although “Snow White and the Seven Dwarfs” was screened in Shanghai in the 1930s, Disney really had no measurable business in China until decades later, when Mr. Eisner secured Sunday evening placement for Mickey Mouse and Donald Duck cartoons on the country’s biggest state-run broadcaster. That led to Mickey’s Corner kiosks that sold consumer goods like Minnie Mouse-branded shampoo, and to more television shows. By the time of the “Kundun” debacle, the demand was clearly there. Mr. Eisner just needed to undo the damage. And just like that, the door to China started to reopen. The negotiations that followed were slow and painful. Disney had to navigate a thicket of agencies, bureaucrats and officials. At one point, Disney essentially had to start over in Shanghai, after a senior Chinese official was abruptly arrested on corruption charges unrelated to the park. There were sticking points large and small. Who would control the park? What kind of transportation infrastructure would support it? 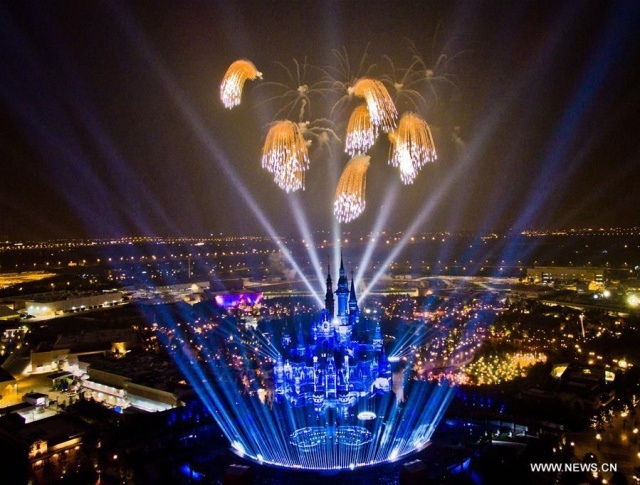 How were Disney’s nightly fireworks shows going to work in smoggy Shanghai? There was also the not-so-minor matter of introducing Disney characters to a country whose icon, since the Communists took power in 1949, was Mao. “Disney had to educate the Chinese government on how they operate, and the government wanted to persuade Disney that they needed a local partner to make this thing work,” said Tang Jun, one of Mr. Iger’s former lieutenants in China. By 2009, the Chinese government was finally on board. It took a 57 percent stake in the Shanghai resort, which includes revenue from hotels, restaurants and merchandise sold on the grounds. Disney also gave the government a 30 percent piece of the Disney management company that runs the property. It was in stark contrast to the deal with Hong Kong. Desperate to end a tourism slump, Hong Kong had given Disney breathtaking terms, including providing a majority of the construction funds. Disney gave up no management control. At the groundbreaking ceremony for the Shanghai resort in April 2011, Mr. Iger and Thomas O. Staggs, then Disney’s theme park chief, posed for a clichéd photo: Holding shovels, the Disney executives stood alongside two of Shanghai’s most powerful leaders, Han Zheng and Mr. Yu, and ceremoniously scooped up loose dirt from an indoor stage. Confetti was blasted into the air. A 50-member children’s choir sang as Chinese dancers and drummers paraded onstage. Mickey and Minnie Mouse frolicked in traditional Chinese costumes. When the Communist Party first invited overseas companies into the country in 1979, global businesses had to team up with the state. It wasn’t pretty. Pepsi found itself managing a tanning factory, as part of its Chinese partnership. McDonnell Douglas claimed that some machine tools had been diverted to a factory that made missiles, in violation of United States rules. The American and Chinese partners in Beijing Jeep disagreed over quality control. “I now tell people, ‘If you don’t have to do a joint venture, don’t,’” said Don St. Pierre Sr., an American businessman who worked for Beijing Jeep. After the blowups, China started to allow some companies to go it alone. But Disney didn’t have a choice. The Communist Party maintains strict control over media companies. The partnership has significant perks for Disney. State-run construction companies cleared a 1,700-acre tract to build the resort, which will ultimately include two additional Disney theme parks and thousands of Disney hotel rooms, analysts say. Authorities have relocated residents, moved graves and closed more than 150 polluting factories. The government built new infrastructure, including a subway line that goes directly to the park’s front gate. Officials have also taken unusual steps to protect Disney from piracy in China, a country where copyright infringement is common and the government rarely intervenes. Whether the state can stand by that pledge is uncertain. But early signs are promising. 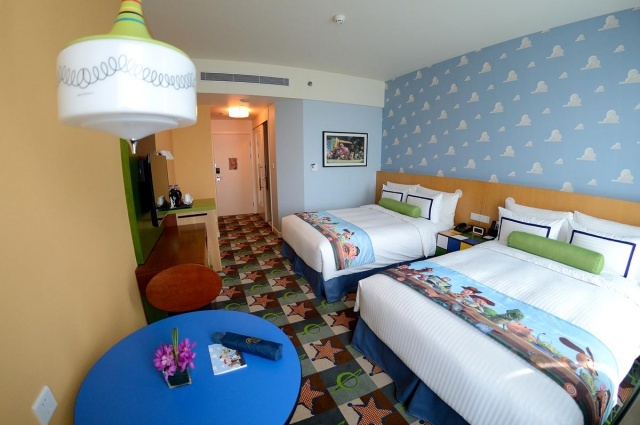 Last November, regulators fined five copycat Disney hotels located near the theme park. Around the same time, nearly 2,000 counterfeit Disney items, including hundreds of Winnie-the-Pooh shirts, were seized in Hangzhou. The government is even sending regulators to Disney for special training to help them better identify counterfeits. But Disney is stepping into a potential minefield. State leaders are growing more confident about exerting influence over multinationals. The government is pushing to upgrade China’s economy, and it wants state-owned companies to learn from partners like Disney while amassing a large share of the profits. Along with its stake in the park, Shendi stands to make a fortune from a 4,000-acre plot of land that it controls around the resort. In other locales, Disney has typically maintained a firm grip on the immediately adjacent real estate. Shendi wants to use such land for hotels, spas and retail, like its new Shanghai Village, a 590,000-square-foot outlet mall, with luxury shops selling Armani, Kate Spade, Juicy Couture and other brands. The Shanghai government sees Disney as just one piece of a broader effort to redevelop Pudong, the city’s easternmost region, by creating industrial parks and tourist destinations. Just 30 miles southeast of Disney’s site, the government has promoted Winterland, which bills itself as the world’s largest indoor ski resort and entertainment facility. Nearby, Haichang Polar Ocean World promises “performances” by beluga whales, dolphins, polar bears and arctic wolves. The partnership structure puts Disney in a complicated spot. Shendi is really a consortium of four powerful government-owned companies: the Shanghai Radio, Film and Television Development Company; Jin Jiang Hotels; Bailian retail shops; and a property developer, the Lujiazui Group. And each of those companies has separate business ties to Disney’s new resort. The Jin Jiang Group has a contract to provide tourism services for the park. The Lujiazui Group helped develop the world’s largest Disney Store. The Shanghai Media Group, a division of the development company, is positioned to capture a big share of the park’s television and advertising budget, since it controls the city’s biggest television stations, as well as major newspapers, magazines and radio properties. So Disney will have to deal with a bewildering array of state affiliates acting as partners, suppliers and even competitors, making contract negotiations complex and raising thorny conflict-of-interest issues. Shendi, for instance, has set up its own energy company to supply natural gas to the theme park site. And Shanghai Media Group has formed alliances or made investments with Disney competitors like Sony, Warner Bros. and DreamWorks Animation. “The more partners you have, the more potential conflicts,” said Oded Shenkar, a professor of business at Ohio State University and an authority on Chinese joint ventures. When Disney unveiled the website for the Shanghai park in March, the fervor was instantaneous. The site registered five million hits in less than half an hour. Tickets for the first two weeks sold out within hours. Over one weekend in early May, with the opening still a month away, more than 100,000 people visited the resort to peek through the park gates and explore a shopping area that doesn’t require a ticket. But criticism has begun, too. Disney has been pilloried in local media for its prices ($1 for a single steamed bun, or about five times the street price). Some initial visitors trampled the public gardens. And Disney has had to deploy uniformed security guards to maintain order at popular rides, where lines during the soft opening stretched up to three hours. Shanghai authorities recently published an etiquette guide. “The frenzy of Mickey Mouse and Donald Duck and the era of blindly following them have passed,” Wang Jianlin, the chairman of Dalian Wanda Group, which operates a chain of Chinese theme parks, said on state television in May. Mr. Iger brushed off Mr. Wang’s criticism as “patently absurd,” and said media reports about food pricing complaints were overblown. “We made a decision with our quick-service restaurants to go higher-end, and there’s a cost to that,” he said. Disney needs to avoid getting lost in translation, an especially difficult proposition in China. It is a deeply American brand trying to break into a country where the government wants to suppress Western ideals. Already, Shanghai Disneyland is triggering concerns about American cultural imperialism. At a gathering of China’s political leaders in Beijing in March, an official called for limiting Disney’s expansion and growth. The country’s leaders have also grown more nationalistic in recent years: Everything must serve the state’s interest. The Communist Party is using Disney to bolster the country’s own media and entertainment companies, as well as to improve China’s image abroad. And the Chinese government is a master of control, known for strictly censoring Western media. This spring, with little warning or explanation, Chinese regulators shut down Apple’s digital book service and DisneyLife, a four-month-old subscription-based movie streaming service operated by Alibaba. Disney is going to extraordinary lengths to prove its commitment to the China and the Communist Party. During a 2010 meeting with China’s propaganda minister, Mr. Iger pledged to use the company’s global platform to “introduce more about China to the world.” And he has done just that. Disney is working with China’s Ministry of Culture to help develop the country’s animation industry and has agreed to work with Shanghai Media Group to make films for global audiences. Notably, Disney partnered with the state to produce “Born in China,” a film that promises to “showcase to the world the spectacular wildlife and natural beauty of China,” which a trailer depicts as snuggly baby pandas, snow leopards and lavish aerial shots of pristine mountain ranges. Builders collected indigenous trees from all around China, including a 59-foot chestnut oak from Zhejiang province, to adorn the grounds. A “Tarzan” show was directed by Li Xining, an acrobatics expert who once worked for the Chengdu Military Area Command under the People’s Liberation Army. The Broadway version of “The Lion King” will be performed entirely in Mandarin — a first. 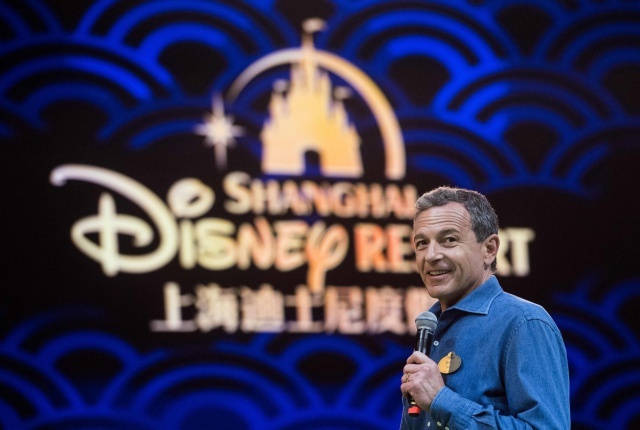 Mr. Iger even came up with a new slogan for the Shanghai resort, calling it “authentically Disney and distinctly Chinese.” He repeats the phrase constantly when talking about the site, and Disney executives in Shanghai have posted it around their offices. It is supposed to be a sign of respect for China and its people. The New York Times - 14 juin 2016. J'imagine que sur Youtube on trouvera la vidéo de l'émission américaine. Le premier jour des célébrations d'ouverture s'est achevé avec la première représentation du spectacle The Lion King au Walt Disney Grand Theatre. Le second jour de festivités débutera dans à peine quelques heures (toujours en mode privé). SHANGHAI, June 14, 2016 – Shanghai Disney Resort celebrated the global premiere of the first Mandarin production of Disney’s THE LION KING Tuesday night in a gala affair at the Walt Disney Grand Theatre. The premiere launched the Grand Opening festivities for the new resort, which officially opens on June 16. A red carpet entry to the new theatre welcomed celebrities, luminaries and Julie Taymor, the Tony-award winning director of the original Broadway production of THE LION KING. One of the most popular and acclaimed musicals of all time, the Broadway hit THE LION KING is presented at the beautiful Walt Disney Grand Theatre, with all the memorable music, drama and grandeur that has entertained more than 85 million people around the world. This is the first time the full Broadway production will be presented at any Disney resort, and it opens to the public on June 16, 2016. The red-carpet occasion also saluted Disneytown—the resort’s international retail, dining and entertainment area—as well as two imaginatively designed hotels and Wishing Star Park. Following the grand opening of those areas, Shanghai Disneyland will open on Thursday, June 16. Disneytown is home to the first Walt Disney Grand Theatre, the first World of Disney Store in Asia and approximately 50 dining and shopping locations. The 1,200-seat Walt Disney Grand Theatre, with its separately ticketed shows, brings an authentic Broadway theatre experience to China. The World of Disney Store is one of the most technologically advanced Disney retail experiences in the world, offering an extensive array of Disney merchandise and many items found exclusively at Shanghai Disney Resort. Disneytown comprises five distinctive areas: Marketplace, Lakeshore, Spice Alley, Broadway Boulevard and Broadway Plaza. Also open is Spoonful of Sugar, a confectionery boutique and show kitchen; LEGO, a hands-on retail experience and world’s largest LEGO store; Wolfgang Puck Kitchen & Bar, the celebrity chef’s latest contemporary restaurant; and Shanghai Min, the popular restaurant chain serving authentic Shanghainese cuisine. The hotels of Shanghai Disney Resort are now welcoming guests to the elegant Shanghai Disneyland Hotel and the imaginative Toy Story Hotel. With more than 1,200 guest rooms, the hotels extend the Disney experience for guests from day until night, with unique dining experiences, character encounters and magical amenities. Wishing Star Park is also open to the public with a serene walking path around the glittering lake, stunning landscape and recreational activities. As the first Disney resort in Mainland China, Shanghai Disney Resort is a magical family vacation destination filled with Disney storytelling and experiences designed especially for Chinese guests of all ages. The resort’s theme park, Shanghai Disneyland, features world-class attractions and live entertainment spectaculars across six themed lands: Adventure Isle, Gardens of Imagination, Mickey Avenue, Tomorrowland, Treasure Cove and Fantasyland, with the Enchanted Storybook Castle. For a complete vacation experience, theme park guests may also stay at the resort hotels, and visit Disneytown and Wishing Star Park. Incorporating unique characteristics that Chinese guests will recognize and appreciate, Shanghai Disney Resort offers a distinctive Disney experience that reflects the beauty and unique identity of today’s China—from entertainment with Chinese acrobats and traditional regional dining options, to the Shikumen architecture at Disneytown and Chinese Zodiac designs in Garden of the Twelve Friends. Shanghai Disney Resort - 15 juin 2016. SHANGHAI Disney Resort will improve services for guests at popular attractions after the official opening tomorrow, said management. The resort identified several problems, the main one being overcrowding at some attractions, during its trial operation from May 7 to June 11 and is taking measures to address them, said Philippe Gas, general manager of the resort. “We will increase the capacity to allow increasing volumes of people going through our attractions rapidly,” Gas said. To make the inevitable long queues more bearable, the resort will arrange entertainment to help people pass the time and “cast members” will offer drinking water to guests, he said. The resort has also launched a mobile phone application to tells guests how long they will have to queue for attractions. Gas said most of the invited guests praised both the attractions and performances, and stated in questionnaires that they were satisfied with their experience. For instance, people have to wait for around three hours for Soaring over the Horizon at the Adventure Isle, which proved to be the most popular attraction during the trial operation. “Everybody wants to do the same thing at the same time,” Gas said. 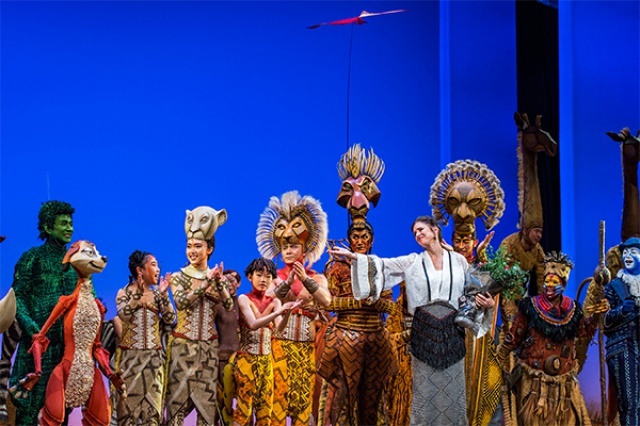 Meanwhile, the first Mandarin production of the popular Broadway musical The Lion King was staged for members of the media and invited guests. It will be performed for the general public at the 1,200-seat Walt Disney Grand Theater in Disneytown from tomorrow. There will be one evening performance a day from Tuesday through Friday, and two performances on Saturdays and Sundays. On the transport front, two theme trains featuring Disney characters are ready to serve park patrons. They will depart from the Disney Resort and Luoshan Road stations at noon tomorrow, the local Metro operator said. 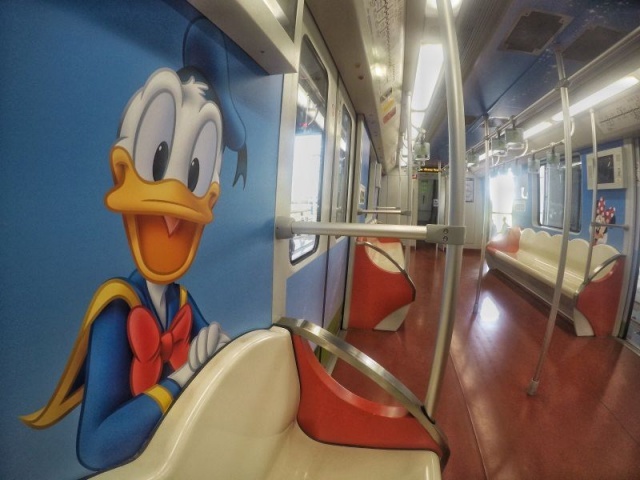 Riders will be greeted by giant stickers of famous characters, including Mickey, Minnie and Donald Duck, on the interior walls when they board. The two trains will be the only ones servicing the last four stations on Line 11: Luoshan Road, Xiuyan Road, Kingpin Highway and the Disney Resort. Another two trains will be added to increase capacity in the future, said the operator. Shanghai Daily - 15 juin 2016. When Shanghai Disney Resort opens its doors to visitors this week, it will make history as the first Disney park in mainland China. Disney Chairman and CEO Bob Iger appeared on "Good Morning America" today, saying the resort was everything he anticipated it to be "and more." "What people have been able to accomplish here is well beyond what I ever imagined possible," Iger said. Shanghai Disney Resort is a project 17 years in the making. Construction of the resort began in 2011. The sprawling Shanghai Disney Resort, which includes a theme park, two themed hotels and shopping complex, is built to host as many as 100,000 visitors each day, according to Disney. In all, the resort took nearly 50,000 hours to build at a cost of around $5.5 billion. The resort, located in the Pudong District of Shanghai, covers 963 acres of land, or roughly the same coverage area as nearly 1,000 football fields and eight 18-hole golf courses. The park is projected to welcome 10 million guests annually, according to the Shanghai Shendi Group, Disney's partner in the project. Tickets to Shanghai Disneyland's June 16 opening day sold out within hours of going on sale, Disney officials said. “Good Morning America” co-anchor Robin Roberts traveled to Shanghai to get a first-hand look at the Disney mania that is taking the world’s most populous country by storm. Roberts reported today on “GMA” from Disneytown, a large retail, dining and entertainment venue located just outside of the park. Basketball legend and Shanghai native Yao Ming, who was named honorary ambassador of Shanghai Disney Resort, said the park was filled with magic. 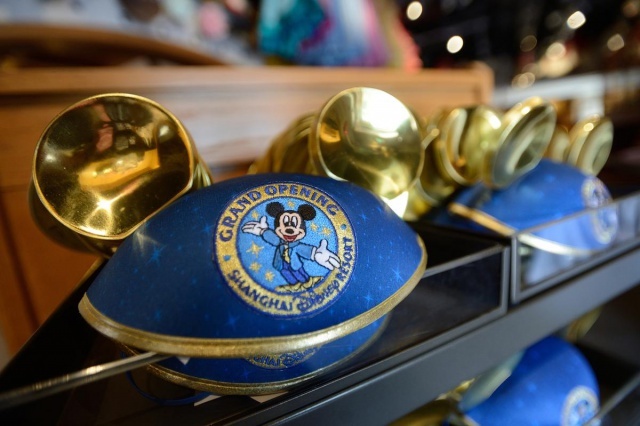 Shanghai Disney Resort merchandise is already flying off the shelves, including specially-designed Mandarin dolls and custom Mickey Mouse ears embroidered in Chinese. The resort’s location puts it within three hours distance of 330 million people, according to Disney. The resort is also expected to bring 10,000 new jobs to China. 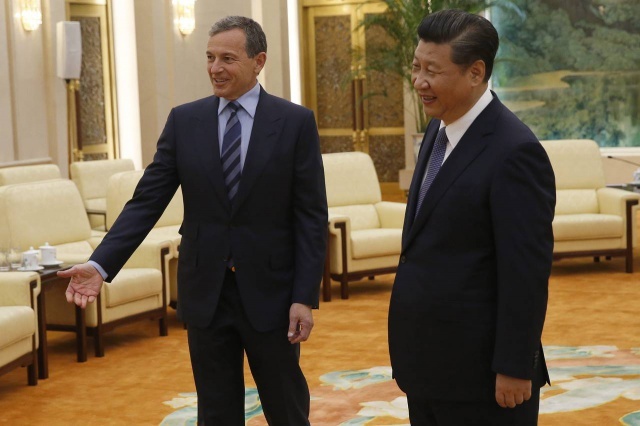 The opening of Shanghai Disney is so significant to China’s economic growth that Chinese President Xi Jinping granted a rare one-on-one meeting with Disney CEO Bob Iger in May. Iger said his vision was to create a theme park that is "authentically Disney yet distinctly Chinese." ABC News - 14 juin 2016. Je n'avais visiblement pas tort de m'interroger en ouvrant un topic sur ce sujet. Il est clair qu'il manque deux ou trois "crowd eaters"
For Disney’s bottom line, it’s not just important for guests to walk through the gates of their theme parks, but to spend money once inside -- and the company’s newest property in Shanghai is no exception. As the Burbank-based entertainment giant gets ready to formally open the gates to its first park in mainland China on Thursday, it has stacked the shelves of its many shops throughout the resort with thousands of items it hopes will prove irresistible to China’s growing urban middle class, from classic plush animals and character T-shirts to special items designed with the Chinese consumer in mind. For the Disney fans with renminbi to burn, there are mouse ears with Swarovski crystals going for $2,700 (limit two per guest) and Disney-themed Pandora brand charm bracelets with 14k gold elements that retail for over $2,900 (again, limit two per guest). Pampered princesses (or in fact, their parents) can fork out up to $455 to get their hair and manicures done and be photographed in the gown of their favorite Disney heroine, then have the entire afternoon documented in a custom-printed storybook that comes packaged in a small pink valise. Mickey enthusiasts on more of a budget might opt to take home some Disney princess-themed plastic chopsticks (set of four, $15.20); a red tea pot and cup set with a Mickey motif formed by stylized Chinese clouds ($55) or a vinegar dish set (again, with a Mickey style, $19). A special line of “vintage Shanghai” items harks back to the Art Deco era in the city (the company likes to remind customers that Disney brought “Snow White and the Seven Dwarfs” to play in Shanghai in the 1930s). There are candy boxes shaped like vintage Chinese lunch boxes, journals with vintage-looking embossing and a doll dressed in 1920s-era fashion. A special vintage set of Mickey Mouse ears, topped with a blue Chinese li mao hat, goes for $24. And that’s not even to mention all the “grand opening” merchandise – T-shirts, bags, blankets, champagne glasses and other items. Jeffrey Towson, a professor at Peking University and author of “The 1 Hour China Consumer Book,” said Disney’s ultimate aim in China is not to become a massive theme park operator on the mainland but to stoke interest in its entertainment offerings and consumer products. “The question is, do they want to make a ton of money off the theme park, or do they see it as a beach head in the Chinese market?” he asked, noting that the deal terms in Shanghai gave much more of an ownership and control stake to the government than have Disney’s developments in, say, Hong Kong or Paris. “I think it’s more of the latter. I think what they are after in the Chinese market is to be the uber children's entertainment company." La collaboration avec le constructeur automobile américain avait été officialisée fin septembre 2014 (voir http://www.disneycentralplaza.com/t2849p625-shanghai-disney-resort-2016-le-resort-en-general ). THE Walt Disney Co will expand the Shanghai Disney Resort "sooner rather than later" and some work has already started, the Disney chairman and CEO Robert Iger said in Shanghai today. Disney still has 7 square kilometers of land to add more attractions with partners Shanghai Shendi Group and local government, Iger said. “When we open, we will continue with the construction to expand what is on the opening-day menu and we are already discussing what to do next year,” he told the global media at a jungle-themed Adventure Isle within the Shanghai Disneyland, a day before its official opening. The US$5.5 billion Disney resort which took about five years to build is a joint venture between the Walt Disney and the Shanghai Shendi Group. In another interview, Iger spoke of new attractions that will be supported by automaker Chevrolet. It will open later this year and a section themed on the Disney cartoon series Toy Story will be open early next year. The second phase of the theme park will be on 3.9 square kilometers and located between the current park and the Value Retail Shanghai Village, an outlet neighboring the Disneyland. Iger also acknowledged today that the trial operations that began in late April has created “little pressure on demand” and the resort was working to resolve the problems found during the trial operation. Kicking off the final 24 hours of previews and trial runs before formally opening the gates of Shanghai Disney Resort, Disney CEO Bob Iger said Wednesday the company is thinking of expanding "sooner rather than later." A $5.5-billion project co-owned by a state-owned investment group, Shanghai Disney is already the largest overseas investment for Burbank-based Disney. But there is a further 7 square kilometers of adjacent land to add more attractions or even separate parks, Iger noted. "We are already thinking of what to do next." More than 500,000 people have visited the theme park since trial operations began in late April, Iger said. Information about the park -- and lines stretching to three hours in some cases -- has spread rapidly via social media, creating "interesting issues" and "a little pressure on demand," Iger acknowledged. But he pledged that the park was working to resolve some of the kinks discovered in the trial phase. Chinese authorities are sensitive about embracing large amounts of "Western culture" and since beginning construction in 2011, Disney has sought to emphasize that this park, more than previous resorts in Tokyo, Hong Kong and Paris, would have a distinct local flavor. Calling Disney an "invited guest" of the Chinese government, Iger said the project needed to show "great respect" for Chinese people and culture. And it needed to incorporate the latest technology and most advanced design the company could offer. The park includes the largest castle of any Disney resort, along with a high-tech Pirates of the Caribbean attraction and a Tron-themed roller coaster unlike any others at Disney parks. Familiar elements from other parks like Space Mountain and Main Street U.S.A. are not present in Shanghai. Trés curieux de connaître les nouvelles attractions avec Chevrolet GM qui doivent ouvrir avant la fin de l'année ,on est en juin ,il ne reste que 6 mois ,pareil pour Toy story Land ,hormis des Wc ,un restau et un pot de terre géant en déco ,il n'y a pas la trace d'un début de construction .Pour la seconde phase de développement pareil ,c'est pour quand vraiment ,on c'est juste de la comm ? ?